The Gopher tortoise, the only tortoise native to the United States, is found in areas with deep sandy soils in northern and central Florida. They are a Species of Special Concern. 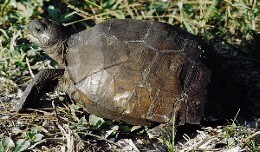 Gopher Tortoises feed on herbaceous plants. They tend to avoid the heat of the day, foraging in the morning and late afternoon. Gopher tortoises are vital to the sandhill habitat because the burrows they dig are used by over 350 species of animals, including bobcats and skunks. 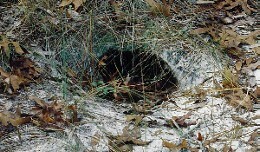 Many rare species, such as eastern indigo snake, gopher frog, and Florida mouse, are dependent on the burrows for survival.